Fact 1: The Salmon-Challis National Forest (SCNF) in the Intermountain Region (R-4) is located in central Idaho and comprises 4.3 million acres (figure 1).The forest manages 1.3 million acres within the 2.4 million-acre Frank Church River of No Return Wilderness (FC-RONR). It is divided into seven administrative ranger districts (RDs) with the headquarters in Salmon, ID (records: 1 and 2). Fact 2: Although the Salmon National Forest and the Challis National Forest were administratively combined in 1998, the SCNF operates under two land and resource plans (based on the previous administrative boundaries) completed in 1987 and 1989. Management direction comes from the Salmon NF plan and Challis NF plan and may differ depending on former administrative boundaries. The land and resource plans are scheduled for revision in 2005. In addition to the forest plans, lands within the FC-RONR wilderness area are managed under an approved fire use management guide and wilderness management plan updated in 2002. The forest's fire management plan (FMP), which received minor updates, was reviewed by forest and regional office personnel earlier in the year and signed July 21, 2003. The forest plans and the FMP require the forest to suppress all fires outside the FC-RONR and to stress safety during initial attack (statements: 12 and 15; records: 1 and 2). Fact 3: Although topography on the forest varies from place to place, it can be characterized by two general landform types: steep areas with very pronounced relief and rolling hills with broad valleys. The steep terrain, called the Salmon River Breaks, is rugged and dangerous country with limited visibility. The terrain transitions rapidly among distinct features — benches, steep slopes (over 70 percent), breaks, and saddles. Vegetation covering the rocky slopes also limits visibility (statement: 32). Fact 4: The steep topography has a significant effect on fire behavior, fuels, and weather. Fire behavior in the hotter part of the day can be extreme, with rapid spread through the canyons, draws, and chutes. Steep slopes not only predispose areas to rapid uphill fire growth, but also cause firebrands to roll downhill. Historically, a fire that burns in the Salmon River Breaks will burn to the top of the ridges and then downhill to the Salmon River because of the sheer ruggedness and steepness of the terrain (statements: 15 and 32; record: 1). Fact 5: The topography has a marked effect on fuels, contributing significantly to differences in moisture and surface heating from place to place across the landscape. These differences influence variations in the amount of available moisture as a function of elevation and variations in surface heating due to aspect (record: 1). Fact 6: Vegetation varies considerably by elevation and aspect. On the hot, dry, south and southwest aspects, vegetation on lower slopes is sparse and has broken rock outcroppings or talus patches with scattered shrubs, grass, and forbs. Above the rocky breaks to midslope, vegetation is a mosaic of barren ground, grass, shrubs, and very open ponderosa pine stands. Because ladder fuels are generally absent, canopies are not prone to crown fire. On west and northwest aspects, closed stands of Douglas-fir of various ages are common. Ladder fuels are present, making these stands prone to crown fire (records: 1 and 3). Fact 7: In 1985, a stand-replacement fire burned through most of Fountain Creek and the adjacent drainage above the Cache Bar boat ramp. Southern aspects consist of grass and scattered shrubs, and the northern aspects are a mosaic of rocky patches and nearly continuous stands of 2- to 4-foot shrubs, primarily shiny-leaf ceanothus. Large, down, woody fuels from fallen snags are scattered through these brush fields (figure 2). Fact 8: The primary fire behavior fuel models in the Cramer Fire area are fuel models 2, 5, and 9 (records: 1 and 3). Fact 9: Shiny-leaf ceanothus burns intensely because there are volatile oils in the foliage. The potential rate of fire spread through ceanothus increases as the growing season progresses from June 20 to September 10. The forest customarily uses brush fields in old burns as an impediment to fire spread (record: 3). 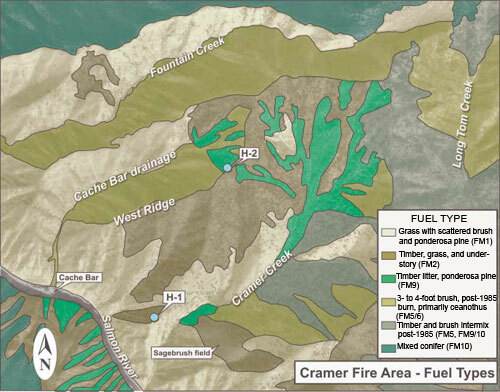 Figure 2—Fuel types in the Cramer Fire area. Fact 10: At 75- to 100-percent live fuel moisture, fires exhibit extreme fire behavior and burn actively through the night. When fires exhibit extreme rates of spread and moderate to long-range spot- .ting, indirect attack is necessary. Air turbulence from these fires may also cause problems for air operations. Live fuel moisture on the SCNF was measured five times during June and July. Moisture levels in conifers sampled on July 21, 2003, ranged from 80 to 110 percent. Shiny-leaf ceanothus sampled on July 30, 2003 was at 104-percent moisture. Generally, live-conifer fuel moisture levels were comparable to or lower than samples taken in early August, 2000. During the 2000 fire season, more than 417,000 acres burned on the forest (records: 3 and 4). Fact 11: The climate in the Salmon River Breaks varies widely with elevation. The majority of annual precipitation occurs as snow during late fall through early spring, with occasional intense, short bursts of rain from summer thunderstorms. Wind patterns in the area are predominantly from the west. Topography influences local weather conditions, especially winds. Upslope/upcanyon winds are common during the summer months. Since these winds are channeled by topography, the local wind conditions are far different from those predicted in the general-area fire weather forecasts. Night time thermal zones are common, especially in the deeper canyons, and contribute to active fire behavior at night (record: 1). Fact 12: The SCNF fire program relies heavily on data provided by seven remote automated weather stations (RAWS) maintained across the forest. The seasonal start and stop dates for data collection and management are the responsibility of the central Idaho dispatch center in Salmon, ID. Annual maintenance of the RAWS sites is the responsibility of the forest. The forest also has two portable weather stations that are deployed to support fire suppression, fire use, and prescribed fire activities. These stations fill in the gaps between the permanent RAWS sites and provide site-specific data to managers. These were not used on the Cramer Fire (record: 1). Fact 13: The Skull Gulch RAWS site is the most representative of the Cramer Fire area, but weather data from this site was inaccurate and unusable because of a temperature and relative-humidity sensor that was not functioning properly. This problem was not discovered and corrected until after the Cramer Fire. The RAWS on the forest had not been maintained or calibrated since September 2002 (records: 5 and 6). Fact 14: The Pocatello, ID, office of the National Weather Service (NWS) provides fire weather information and forecasts for the forest, including daily fire weather forecasts and spot forecasts. The forest is required to use forecasts from the NWS servicing center in Pocatello, even though those from the NWS servicing office in Missoula, MT, are more accurate and useful. In particular, wind predictions from the Pocatello spot weather forecasts are unreliable and the forecasts frequently do not reflect actual conditions on the ground. Weather from previous days is often a more reliable predictor than forecasts from Pocatello. Conditions on the North Fork RD where the Cramer Fire occurred, had been the same for several successive days (high temperatures, low humidities, and brisk afternoon winds) (statement: 21; record: 7). Fact 15: The Long Tom Lookout generally provides weather information to fire suppression personnel in the area, including the first three days of the Cramer Fire. The difference in elevation between Long Tom and the fire was too great for the lookout's weather observations to be valid for the fire area (statements: 5 and 10; records: 8 and 9). Fact 16: Two indexes from the National Fire Danger Rating System are commonly used to express fire danger and track seasonal trends — the Burning Index (BI) and the Energy Release Component (ERC). Fact 17: The BI reflects the difficulty of fire control. The ERC reflects the contribution that all live and dead fuels have to potential fire intensity and is a good indicator of the overall fire danger resulting from local fuel-moisture conditions. It communicates expected fire danger to fire personnel and allows them to associate the numeric values with real-life experiences in the area. Forest fire suppression personnel use the ERC to estimate fire growth potential and in complexity analyses (record: 1; NWCG Web site). Fact 18: The forest also uses the Haines Index as an effective indicator of potential fire behavior. The index is included in the daily zone fire weather forecast and is read by dispatch when the daily fire weather forecast is transmitted to field units (record: 1). Fact 19: The forest was experiencing fires comparable to the year 2000 when two fires burned 417,000 acres on the forest. During July 2003, the forest and Eastern Great Basin were at preparedness level IV. The BIs and ERCs were near the high-end; the forest BI was well above 90 percentile and the ERC was at 96 percentile, indicating dangerous conditions. The forest had just experienced a 15,000-acre fire on the Leadore RD, a district with historically low fire occurrence and smaller fires. The Eastern Great Basin Coordination Center issued an updated safety alert that was distributed to all personnel, emphasizing the dangerous conditions and the need for aggressive initial attack. The Fire Danger Pocketcard is a method of communicating information about fire danger to firefighters. A crew on the Cramer Fire had reviewed their pocketcards a few days before the Cramer Fire and recognized that they were at conditions comparable to those on the Clear Creek Fire in 2000 that burned 217,000 acres (statements: 1, 16, 36, and 37; record: 10; NWCG Web site). Fact 20: On the north side of the forest and in the vicinity of the Cramer Fire, the fire regime is low severity and high frequency (ponderosa pine and dry-site Douglas-fir). Fires historically burned as low-intensity surface fires, and crown fires were uncommon. Fire exclusion in recent decades has dramatically altered the stand structure in this forest type, with a significant increase in the density of ponderosa pine and Douglas-fir on all but the driest sites. At the higher elevations in the Cramer Creek drainage, mixed conifer stands mark a transition to the infrequent, high-intensity regime of the high-elevation subalpine fir (record: 1). Fact 21: Fire season on the SCNF normally runs from July 1 to September 15. The forest is a high-fire-load forest, one of four forests in R-4 with a high fire occurrence. Based on the last 10 years, the SCNF averages 120 fires and 52,000 burned acres per year. Recent fire events have increased dramatically in size and severity. Two fires, the Clear Creek and the Salmon-Challis Wilderness, for example, burned 417,000 acres in 2000. Most of the fires on the forest are lightning caused and start at higher elevations. The forest had an initial attack success rate of 94 percent from 1998 to 2002 (statements: 9, 15, and 24; records: 1 and 4). Fact 22: Fire shelter deployments occurred on three fires on the forest — two shelter deployments (one fatality) on the Ship Island Fire in 1979, 82 deployments (no fatalities) on the Lake Mountain Fire in July 1985, and 73 deployments (no fatalities) on the Butte Fire, also in July 1985 (records: 1 and 26). The role of the SO fire staff is to provide support, guidance, and oversight to fire programs on the RDs (statements: 9, 12, 21, 27, and 28). Fact 25: The central Idaho dispatch (CID) center was transferred from the SO fire staff and placed under the management of an interagency board of directors. Forest Service positions include a logistics coordinator, lead dispatcher, part-time aviation dispatcher, and part-time fire warehouse supervisor (statement: 12). Fact 26: Since 2001, decisionmaking and fire management on all but Type I fires were delegated to the RDs. However, the RDs are expected to coordinate with the SO on large fire incidents. District rangers with fire experience were given the authority to manage Type II fires. The SO continued to manage Type I fires. Each RD has its-own fire organization (table 1) , which varies from district to district, except for the Leadore RD which functions as a zone organization with the Salmon-Cobalt RD and the Yankee Fork RD which functions as a zone organization with the Challis RD. The three districts with the heaviest fire load have a fire management officer (FMO), an assistant fire management officer (AFMO), a helitack crew, and several engines. In addition, a national helicopter module is assigned to the Middle Fork RD. It consists of a foreman, assistant foreman, lead crewmember, and seven seasonal crewmembers. The district and zone fire organizations report to district rangers. The SO provides aviation management, but the helicopters are assigned to the districts (statements: 9, 12, 15, 21, and 27). Fact 27: The flow of information and fire management coordination changed with the expanded fire organization, reducing the amount and type of information shared with the SO fire staff as well as their participation in critical fire management decisions. The North Fork and the Middle Fork RDs are managed by one district ranger and have the largest fire programs on the forest. The districts combined have 85 percent of the fire activity on the forest and 95 percent of the forest's roadless areas. The North Fork and Middle Fork RDs assumed greater autonomy under the new organization and coordinated less with the SO, causing friction in the new organization, confusion below the operations staff officer as to SO staff roles and responsibilities, and possibly reduced organizational effectiveness. The deputy FMO noted, for example, that the SO fire staff had been less involved in day-to-day fire management and that he was marginalized in the expanded organization. Although the forest supervisor was aware of some organizational tensions and problems, he did not feel they hampered fire safety. He stated that he "took some of the sting out of the district running everything" by incorporating checks and balances in the fire management decisionmaking process. The regional director of aviation and fire management (A&FM) stated that upcoming reviews of the forest's fire organization might surface and address the issues and concerns about fire management on the forest (statements: 9, 12, 21, 24, 27, and 28). Fact 28: The forest supervisor, the regional director of A&FM, and a deputy regional forester thought the SCNF fire organization worked well. From a communication standpoint, the regional fire staff has a conference call every Monday with forest FMOs in R-4 to discuss current issues, safety messages, and other fire business. The operations staff officer on the SCNF and the forest FMO also have a formal conference call every Monday with the district rangers to share fire management information. Every Tuesday, the district FMOs and the forest FMO have a conference call to discuss fire danger, general fire management strategies, and specific fire strategies and tactics (statements: 1, 9, 15, 24, and 27). Fact 29: Fire funding decreased after 2001. The forest had an expanded organization, insufficient funds to fill numerous vacant positions, and conflicting strategies for managing fire vacancies. The forest FMO and his staff supported reducing overhead at the forest and district levels in order to fill initial attack positions. The district rangers and the operations staff officer generally felt that overhead was more critical because of the hard decisions that needed to be made during project fires. Although the forest's 2003 initial budget allocation was 51 percent of MEL (most efficient level), the final allocation was 95 percent of MEL during the third quarter of the fiscal year. The forest postponed strategic organizational decisions because of delayed budget allocations, and later decided to fill key overhead/supervisory fire positions to provide leadership needed on fires. In the interim, existing forest fire personnel typically performed their own duties as well as the duties of the vacant fire positions. Broader organizational staffing issues, however, remain unresolved (statements: 9, 15,21,27, and 28; record: 1). Fact 30: The Cramer Fire was on the North Fork RD. The FMO position on the North Fork RD remained vacant 1 to 1½ years prior to and during the Cramer Fire, although a new hire for the position arrived shortly afterward. The delay in filling the district FMO position was partly because of concerns by the forest FMO that the district did not have adequate, long-term funding. The AFMO on the North Fork RD is Alan Hackett,who had been on the district since May 2001. He was detailed to the FMO position for a 120-day acting assignment. For interim periods, when others were not detailed to the position, Hackett was assigned the duties of the district FMO (statements: 1, 14, 15, 21, 25, 27, and 28). Fact 31: Red-card certification on the forest is very tightly managed and monitored, ensuring accurate and up-to-date qualifications of fire personnel. The forest established a red-card committee which reviews the qualifications of fire personnel on the forest. It also has an incident commander (IC) committee that reviews IC qualifications, performance weaknesses, and needed training or experience. To monitor performance, the forest requires evaluations of fire personnel before returning from a fire assignment. Even with this level of oversight, some personnel were concerned that the addition of new or inexperienced people may impact safety and situational awareness on fires. The forest supervisor and North Fork/Middle Fork district ranger considered Alan Hackett, the Cramer Fire IC Type III on July 21 and 22, to be one of the safest Type III ICs on the forest. Hackett is trained and qualified as a Type III IC. Other personnel on the fire also met agency qualifications (statements: 1, 12, 15, 26, 27, and 32). Fact 32: The forest was able to accomplish all of its preseason fire training, which included training for returning firefighters and fire shelter training. Each line officer conducted an "expectations briefing" for ICs, helicopter foremen, and other supervisors. If fire personnel missed the briefing, the forest supervisor and the operations staff officer briefed them later to ensure that all fire personnel were fully informed (statement: 15). Fact 33: The forest's safety record has been above average in R-4. The forest supervisor consistently emphasized firefighter and public safety as his highest priority and cautioned against taking risks that jeopardized human life (statements: 12, 21, and 27). Fact 34: During fire season each year, the forest supervisor received daily fire briefings from his staff, visited with personnel on fires to stay informed, met with the crews, participated in district orientations, and emphasized his safety message at several different locations. In June of 2002 and 2003, the forest supervisor met with his Type III, IV, and V ICs to discuss expected weather conditions, implications for the fire season, and public and employee safety (statement: 27). Fact 35: The regional office (RO) monitors compliance of the Thirtymile Action and Prevention Plan, communicates the importance of fire training, funds training activities, and stresses the need to use the Great Basin Incident Organizer on wildland fires staffed by forest employees. Each year, the district rangers and FMOs on the SCNF jointly conduct after-action reviews to improve fire management on the forest. District FMOs monitor fire operations for safety and compliance with work/rest guidelines (statements: 9, 16, 24, and 27). Fact 36: The forest supervisor, the North Fork/Middle Fork district ranger, and the operations staff officer indicated that past and current fire experience, training, safety messages, job hazard analyses, and/or red-card qualifications constitute effective risk management on the forest (statements: 1, 15, and 27). Fact 37: Even though the fire season started slowly because of average winter snowpack and precipitation, June turned hot and dry. A burst of late spring moisture resulted in pine fuel growth and good grass cover through all elevations. Up until June 10 or 11, the forest had approximately 20 fires (statements: 15 and 27). Fact 38: On July 12, between 1400 and 1500, the Tobias Fire on the Leadore RD began growing rapidly, expanding from 400 acres to 13,000 acres in 6 hours. By the following weekend, fires increased because of lightning activity (statement: 15). Fact 39: Facing heightened fire danger, the forest requested $9,000 for preventing human-caused fires associated with an air show on the southern end of the forest (statement: 28). Fact 40: On Saturday, July 19, the recently ignited Blackwall and Tobias Fires required Type II incident management teams. [————] operations staff officer, provided support to the team on the Blackwall Fire while [————], the forest FMO, supported the team on the Tobias Fire. The deputy FMO left for a house-hunting trip in central Oregon (statements: 12 and 28). Fact 41: On Sunday, July 20, additional lightning starts were reported, including the Crystal Fire, Dutch Lakes Fire, and the Cramer Fire. The Dutch Lakes Fire was given highest priority. If it reached stands of bug-killed trees, it had the potential to burn into the town of Stanley, ID. At 400 acres, the Crystal Fire was second priority, and the Cramer Fire, at 20 acres, was third priority. [————] the district ranger for the North Fork and Middle Fork RDs, was working as a supervisory dispatcher in the SO. She had the Blackwall and Crystal Fires burning on her districts. [————] informed her that she had a new fire, the Cramer Fire, on her district and indicated what resources were being dispatched. She was shown maps that indicated where the Cramer Fire was located (statements: 1, 5, 12, 15, and 28). Fact 42: On Monday, July 21, [————] and [————] were preparing to in a regional fire preparedness review, which had been canceled the previous year. The regional office was aware of the fire situation on the forest, but chose to hold the review as scheduled. [————] was involved in a transition from a Type II to a Type III team on the Tobias Fire and a consultation with the RO about initial attack issues. Later in the day, he was also preparing an inbriefing for the Crystal Fire Type II team. [————] was at the North Fork RD. She informed Alan Hackett, her AFMO, of the Cramer Fire. She briefed him on the fire location, identified [————] [————], the district FMO on the Salmon-Cobalt RD, as the IC, and told Hackett to contact [————]. Hackett was unable to contact [————] and subsequently talked with [————] around 0830. Shortly after a call between [————] and Hackett, [————] approved Hackett as the Cramer Fire IC. [————] worked the rest of the morning on North Fork RD business, and at midday ordered a Type II team for the Crystal Fire. She traveled to Salmon, ID, for a Fish and Game meeting and remained in Salmon for most of the day. In the late afternoon, she heard Hackett over the radio express concern about the Cramer Fire burning down to the Salmon River road. She ordered a patrol for the road through dispatch. She traveled to the Blackwall Fire to serve as the agency administrator's representative and returned home at 1930 (statements: 1, 9, 15, and 28). Fact 43: In response to extreme burning conditions and the large fires on the forest, central Idaho dispatch was aggressive about sending resources to new fire starts, including the Cramer Fire (statements: 8 and 36). Fact 44: By Tuesday, July 22, the forest was focusing on the Tobias, Crystal, and Blackwall Fires, while ensuring that the Dutch Lakes Fire was contained. In the meantime, the forest had two new fire starts. The RO fire preparedness review began that morning, involving [————] and [————]. At 1300 or 1400 a new large fire, the Frog Pond Fire, started near Lost Trail Pass, and [————], who was participating in the RO review, decided to take members of the review team to the fire to witness it first hand. Radio and phone communications were limited. His attention was focused on the Frog Pond Fire and the Blackwall Fire, which had the potential of burning together. [————] was at the Middle Fork RD early Tuesday morning, working on a wildland fire situation analysis (WFSA) and delegation of authority for the Crystal Fire. She briefed the Type II team at 1000 and spent the morning and early afternoon with them. During the afternoon, she spent time managing issues related to the Frog Pond and Blackwall Fires. She had no contact with the North Fork RD until she called the RD at 1700 (statements: 1, 15, 27, and 28). Fact 45: According to the SCNF operations staff officer, an IC typically would talk to the district ranger, district FMO, forest FMO, forest duty officer, or zone duty officer to discuss strategy and tactics on a fire (statements: 1 and 15). Fact 46: In the absence of a district FMO or AFMO, the zone duty officer can provide guidance to an IC on initial attack (statements: 1 and 15). Fact 47: When discussing strategy and tactics with the district, the forest FMO is the principal contact with the district FMO. The operations staff officer communicates with the district rangers about fires on their districts, although the forest FMO may also, depending on the circumstances (statement: 15). Fact 48: The operations staff officer generally does not get involved with the strategy and tactics on Type III incidents such as the Cramer Fire (statement: 15). Fact 49: In a discussion with the North Fork/Middle Fork district ranger on Sunday night, July 20, [————] informed [————] that the strategy for the Cramer Fire was to use a helicopter for bucket work and a hand crew to control the fire at the smallest acreage. She heard this again in a secondhand conversation between Hackett and [————] on Monday morning, July 21. From that point on, her information about the strategy and tactics on the Cramer Fire came from the radio on Monday afternoon and from radio logs after the accident on July 22 (statement: 1). Fact 50: The zone duty officer or district FMO and the IC typically use the Incident Response Pocket Guide extended attack transition analyses to make decisions about incident complexity (statement: 15). Fact 51: After consulting with the IC, the zone duty officer or district FMO informs the SO fire staff when a fire is exceeding a district's capabilities (statement: 15). Fact 52: The forest uses four guidelines to analyze the complexity level of a fire (statement: 15; records: 11, 12, 13, and 27). Fact 53: Based on discussions with the SO fire staff, preparing wildland fire situation analyses (WFSAs) on all but Type I fires was the responsibility of the ranger district. In the case of the North Fork RD, the AFMO would prepare a WFSA with the North Fork/Middle Fork district ranger, who would approve the WFSA (statements: 1, 14, and 15). 1—Suppression efforts have not succeeded or are not expected to reach containment within 24 hours. 2—The initial attack incident commander (IC Type IV or IC Type V) requests additional resources that result in fire complexity attaining Type III status within or following the first 24 hours following the arrival of the first suppression resources. The Cramer Fire became an extended attack fire when [————], the IC Type IV, requested an IC Type III at approximately 1938 on Sunday, July 20 (statement: 20; record: 15). This transition request should have triggered the need for a complexity analysis and WFSA. No complexity analysis or WFSA was prepared on July 20, 21, or 22. Fact 55: The North Fork/Middle Fork district ranger did not know if a complexity analysis had been done for the Cramer Fire (statement: 1 ). Fact 56: According to the district ranger, no WFSA was prepared, because she had not been advised that the fire had escaped and that a WFSA was required. Normally, she would receive that information by radio or cell phone, and the zone duty officer or district FMO would have kept her informed. She did know, however, that an IC Type III had been ordered on July 20, and she approved her North Fork AFMO as the IC Type III early in the morning on July 21. The forest FMO, zone duty officer, and CID also knew that an IC Type III had been ordered on July 20 (statement: 1). Fact 57: The operations staff officer recognized that the Cramer Fire was an extended attack fire with an IC Type III, but larger fires on the forest received higher priority. The North Fork/Middle Fork district ranger, the forest FMO, CID, the zone duty officer, and the operations staff officer should have known, based on the FMP and the transition to an IC Type III, that a complexity analysis and WFSA were required (statements: 1, 14, 15, 20, and 36).